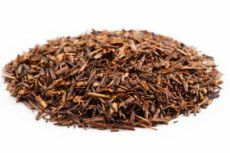 Organic Rooibos, cinnamon, orange peel, cloves, cinnamon orange spice flavor, cinnamon flavor. Research all the health benefits of rooibos tea and cinnamom. Naturally decaff.